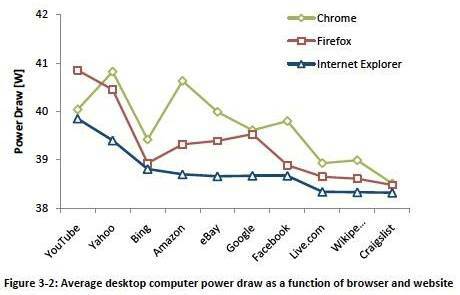 Microsoft has released a study (PDF, 700 KB) system power consumption using popular web-browsers on Windows 8. The estimation was made by measuring the energy consumption at the opening on the laptop and the desktop model scenarios with the popular web-resources, such as YouTube, Yahoo, Bing, Amazone, Wikipedia, Google, Facebook, etc. 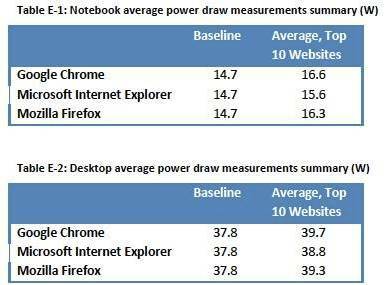 The result is made, the conclusion that the power consumption is a leader in Internet Explorer 10, followed by Firefox 20 and Chrome 26 on the third. Moreover, if, discard features graphics scaling, the differences are not so great, and are a maximum of 1.2 W at a total consumption of desktops at 40 watts (2.5%) and a laptop at 16 watts (6%). Notably, that the prize of IE is generally noticeable at display of video or an interactive graphic content of Flash, during normal operation the differences are minimal. Interestingly, during the test Fish Bowl, instead of opening sites in the first place beat out Firefox (32 W), followed by IE (34.9 watts) and the third Chrome (37.6 W). 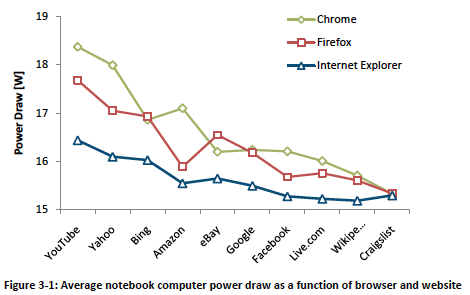 Internet Explorer is the best-performing browser, which will gladden battery-dependent laptop users.